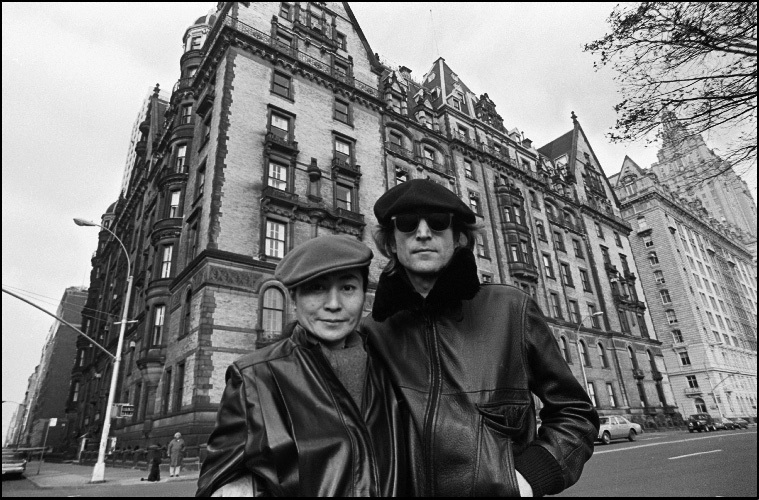 Yoko Ono and John Lennon standing in front of The Dakota, their home in New York City. Central Park, a two-and-one-half mile-long swath of green in the heart of Manhattan, is right up there with Times Square and Ground Zero as must-see sights for visitors to New York City. And the part of Central Park that gets the most visitors per acre (yes, that’s how these things are measured) is Strawberry Fields, the memorial to John Lennon and peace. It was Lennon’s widow, Yoko Ono, who came up with the idea of creating a peace garden across the street from the Central Park West sidewalk where the former Beatle was shot in 1980. The following year Ono invited countries around the world to contribute to Strawberry Fields, and 50 nations donated stones, plants, even trees. This was one of the first major undertakings of the then-new Central Park Conservancy (which today funds 85% of the park’s maintenance costs, not to mention capital improvements), and it helped reverse the fortunes of a great park that seemed to have hit the skids. 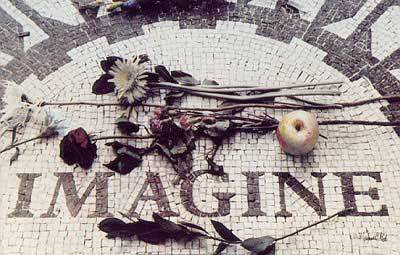 "Strawberry Fields: Central Park's Memorial to John Lennon" by Sara Cedar Miller. Strawberry Fields: Central Park’s Memorial to John Lennon (Abrams), a new book by the Conservancy’s official historian and photographer, Sara Cedar Miller, explores this much-loved part of the park with photographs, maps, and sharp insights. 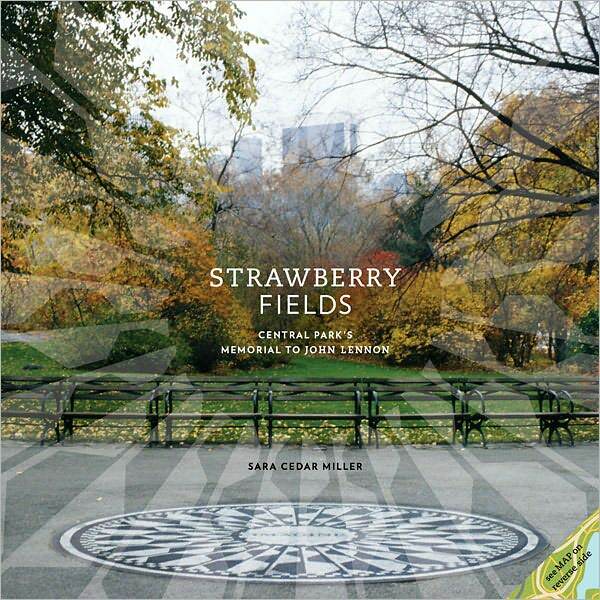 We asked Miller a few questions about Strawberry Fields and the rest of Central Park. Ed Wetschler: What’s the one thing about Strawberry Fields that gets everyone’s attention? Sara Cedar Miller: Yoko Ono conceived it as an international garden of peace as well as a Lennon memorial, so visitors are moved by the way contributions of different nations reside side by side. But above all, they want to see the circular, black-and-white Imagine mosaic. EW: What do visitors do in Strawberry Fields? SCM: They leave mementos: notes, photographs, poetry, guitar picks, even strawberries. Some visitors sing; others just stand silently. Some leave coins, as they might at wishing wells. EW: How can people learn more about Strawberry Fields? SCM: Take the “West Side Stories” tour, one of a dozen or so walks run by the Central Park Conservancy. The guides are very good, and so is the price: These walks are free. EW: Is Strawberry Fields the most romantic part of Central Park? SCM: I think the whole park is romantic. Taking a boat out on the lake is romantic. The Bow Bridge over the lake is so romantic that people propose marriage there. The allee of American elm trees on the mall is glorious, as are the Conservatory and Shakespeare gardens, Belvedere Castle, and so on. EW: Aside from obviously man-made features like the Castle, the gardens, ballfields, and Strawberry Fields, etc., is the Central Park landscape natural? SCM: The mica schist bedrock you see is where it always was, but park administrator Frederick Law Olmsted and architect Calvert Vaux also blasted a lot of rock – for example, to create the Sheep’s Meadow — moved a great deal of earth, and planted new trees and shrubs. Central Park is the greatest American work of art of the 19th century. EW: Do you have a favorite part of the park? SCM: I have several: One of my favorites is at the north end at the ravine – around 102nd and 103rd streets – where waterfalls remind some visitors of Hudson River School paintings. In fact, that’s just what park Olmsted and Vaux had in mind, so they constructed a concrete wall with artfully placed boulders; the water running over it is New York City drinking water. EW: What do out-of-towners learn about New York or New Yorkers when they visit Central Park? SCM: Central Park is the best place for people-watching in New York City. This is where visitors can see New Yorkers at play, where they can sit on a bench and meet the locals. In Central Park, most people are not in a hurry; they will stop and talk with you. EW: What’s the wackiest thing you’ve seen anyone doing in Central Park lately? SCM: I saw a man in a rowboat, rowing with one hand and pecking at a laptop with the other. That’s New York-style multitasking. Ed Wetschler is the associate editor of Everett Potter’s Travel Report, and the executive editor of Tripatini. Whenever I visit New York City I visit the Central Park Conservancy’s gardens, in the northeast part of the park. The lilacs and wisteria are beautiful! These gardens please me in all seasons, even winter. The wishful feeling of Central Park with Tavern on the Green.